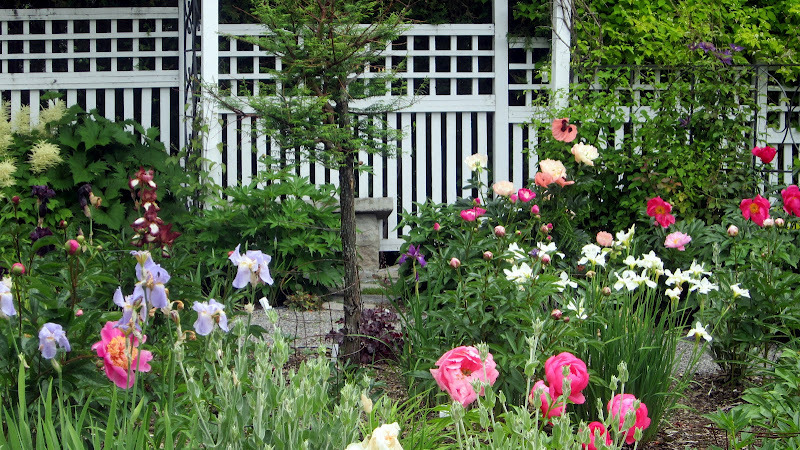 Every year, the Prairie Peony Society Annual Show starts with enthusiasm and high expectations. This year was no different. However, the weather may have lowered the enthusiasm and expectations somewhat in the weeks preceding the show. Regina (where most of our members reside) experienced hail, high winds, and one night very close to freezing then extremely hot weather. 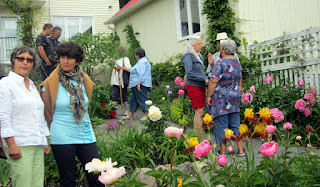 Lots of members were saying that many of their peonies were done or close to being done prior to the show. As seems to be typical of our show o matter which weekend we hold it, the temperature soared for the two days of our show. Thankfully, the venue where we held the show, the Cathedral Neighbourhood Centre, had air conditioning. The temperature must have been set perfectly because the peonies didn't close up during judging, which happened at one of our previous shows. The Thursday before the show, a few Prairie Peony Society members began setting up tables, hanging the curtain behind the Court of Honour, putting out informative signs, putting together the flower vases, and establishing space for each category in the show. Set-up was complete within three hours and would make it considerably faster for members to get their entries ready the next morning. On the first day of the show, many members were in early (around 7 a.m.) to prepare their peonies and floral art for display. Three hours are generally set aside for this preparation prior to judging. Some of our members have a large number of varieties of peonies to display and this year was no different. Every last minute was used to get their entries in on time. Once all entries were ready, the judging began. This year, Delores Nelson judged Artistic Floral Design and Goblets ad Bowls. Bernie Zaharik judged all the peony entries. 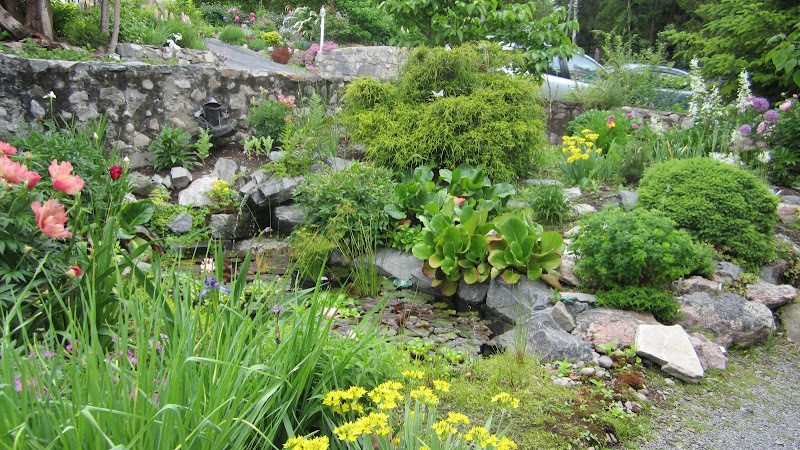 Clerking was completed by Dorothy Rogers, Brian Porter, Shelley Brenner, and Gladys Ning. Photography was judged by Shelley Brenner, Dorothy Rogers, and Gladys Sykes. Public viewing began Friday at 1:30 p.m. and went until 8:00 p.m. that evening. 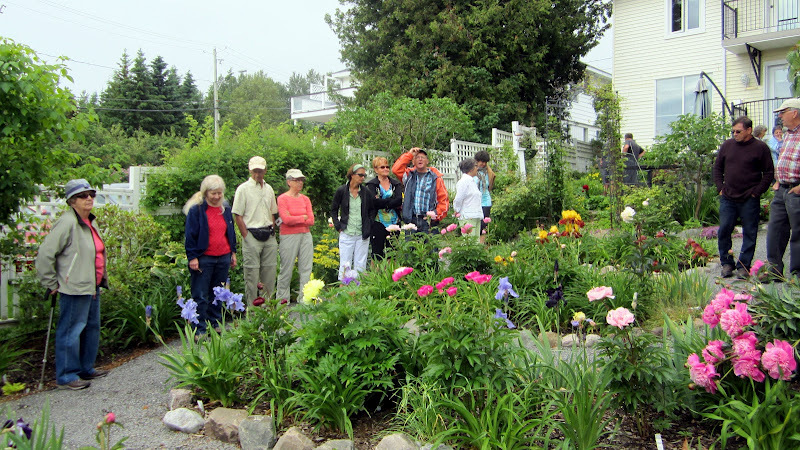 On Saturday,, public viewing began at 10:00 a.m. and went until 3:45 p.m., at which time, our President, Doug Bradford, gave a small speech and introduced Anne Leskiw, one of the original-founding members of Prairie Peony Society. Anne was there to pass the original guest book to Doug. It signified a changing of the guard and the start of a new beginning for our society. After the change Doug indicated that for a small donation, the public could take home some peonies that any of the entrants didn't want to take home with them. This is an incredibly popular tradition that we have at the show. Lots of people showed up near the end to take in the displays and then waited around for the peony dispersal. This year proved to be better than previous years for donations as we pulled in almost $300.00 which is the most we've taken in recent years. This year, a number of peony categories remained empty. That could be attributed to the weather, the change in show dates (one week later this year than previous years), or possibly both. In the past, our Annual Show has been the second-last weekend in June. This year our new President, Doug Bradford, changed the show dates to the last weekend in June after polling the members. Doug explains: "By adjusting the annual show date by five to seven days, (from) June 22nd (to) June 29th for the Prairie Peony Society, (it) gives members an opportunity to showcase different cultivars and the public an opportunity to view different peony blooms as was the case this year when considerably fewer hybrids but many more lactifloras were on display." 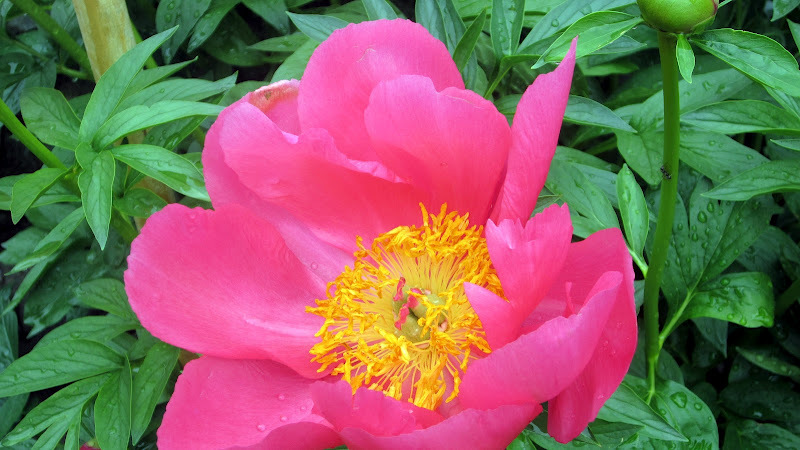 The Prairie Peony Society members still managed to pull together 185 entries in peony stems, 12 entries in photography, 20 entries in Artistic Floral Design, and six entries in bowls/goblets for a show total of 223 entries. 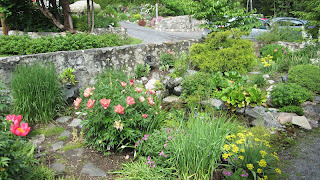 The most heavily entered section was pink Japanese lactiflora peonies with 20 entries. The light pink double lactifloras were second at 13 entries and the white lactifloras were third with 11 entries. We had a few more Artistic Floral Design entries than previous years. The category where the design was to be in an unusual container sparked a lot of creative juices for our entrants as we had some truly clever designs in that category. It was also the most entered category of Artistic Floral Design with 7 entries. 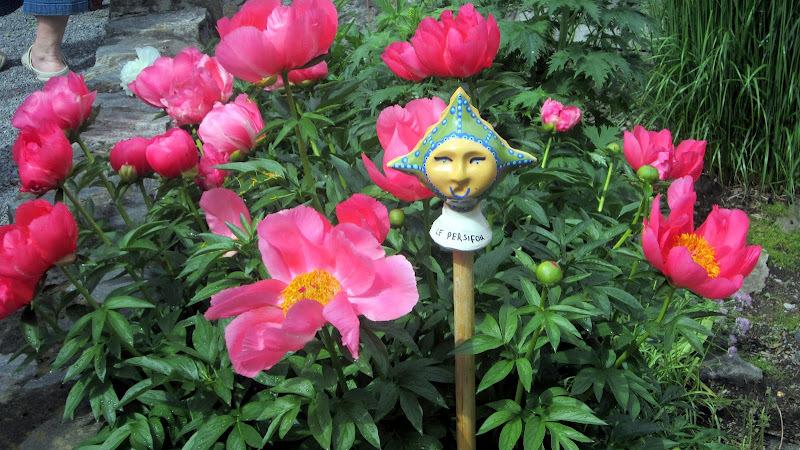 This year, the Prairie Peony Society Annual Show started with enthusiasm and high expectations, which may have initially been lowered. However, we had a great show again this year. Everyone enjoyed themselves. The peonies were pretty nice considering the weather before the show. Lots of people remarked how nice the fragrance was in the show room, and members of the public got to go home with some exceptional blossoms. I think we're all looking forward to next year with renewed enthusiasm. 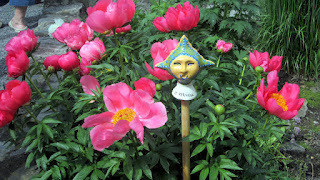 How could you not be enthusiastic if you saw the variety of peonies that we can grow right here in Saskatchewan? À la Société québécoise Pivoine et Jardin botanique Van den Hende Show qui s'est tenu le 16 et 17 Juin, 1187 pivoines ont été présentés et il y avait 1 750 visiteurs. La plantation de plus de 150 pivoines ont été faites par les deux sociétés. Voici quelques-unes des manifestations de pivoines de la série. Carol was born in Simcoe, Ontario to Dorothy and Dwight Van Vezler She worked as an EEG (Electroencephalography) technologist in many countries, including England, the United States and Canada. She retired from the Alberta Children’s Hospital in June 2002. She travelled extensively to Europe, Africa and Asia. 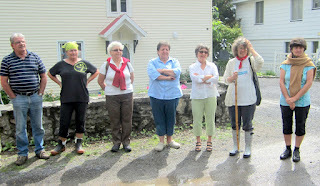 Carol was a tireless volunteer in her retirement years. 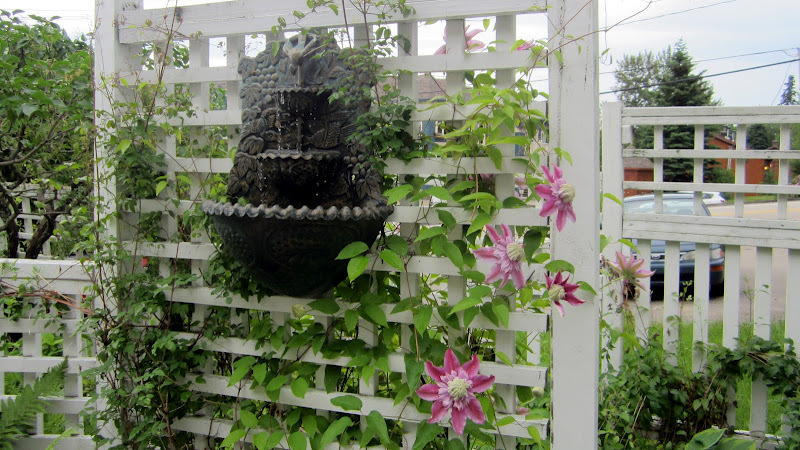 Although her main passion was the Sheltie Rescue Society where she found homes for many rescue dogs, she also loved her gardening. She always came to our Calgary CPS meetings despite the weather and sometimes with a few rescue dogs in tow! Carol could always be counted on to help with any of our projects, especially our hosting of the annual CPS show a few years ago. She was able to share her time with the Calgary Horticultural Society, the CPS and the Lougheed House. 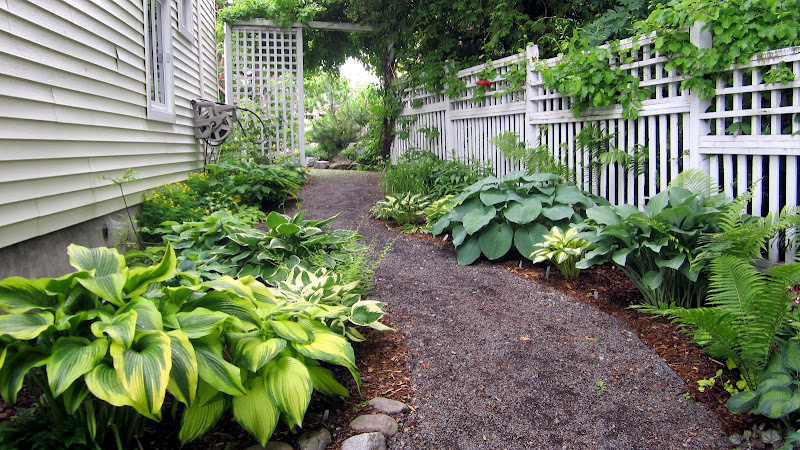 Her beautiful garden won many awards. She had an outstanding collection of peonies and hostas. Despite Carol’s illness, she was still the courageous volunteer and showed up at the CPS booth and the Lougheed House booth at the Garden Show, April 2012. 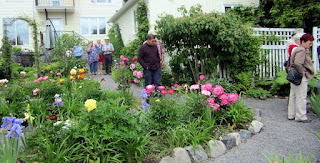 A garden party was held at her home, the first week of July 2012, to remember this wonderful lady. Newcastle resident Helena Ho uses her nose to seek out the still-glorious blossoms at Oshawa Valley Botanical Gardens on Sunday. The displays were at their best two weeks ago, thanks to an early spring, which festival organizers hadn't planned on. Constance Spry was fading fast. Joseph Rock could hardly hold his weary head up. But Florence Nicholls, pretty in pale pink, was still fresh as a daisy. 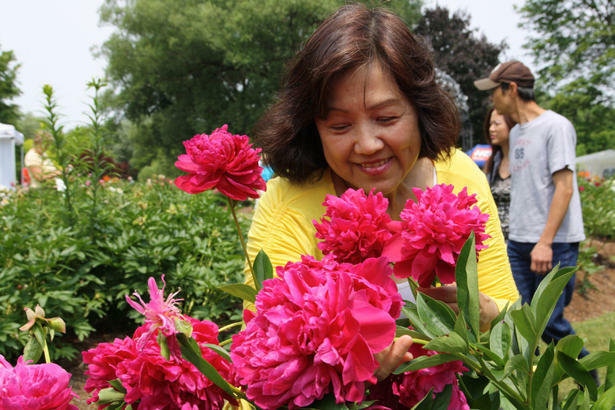 The weekend event, billed as the largest of its kind in the country, drew visitors and participants from across the province to Oshawa Valley Botanical Gardens, where 325 varieties of peonies show off their best stuff in May and early June. According to Denny, the show judges look for the perfect bloom that’s symmetrical, appears “untouched by wind or rain,” is as soft as a tissue — but not too soft — and stands up straight on its stem. A tall order, perhaps but “just dumb luck” snagged the title of grand champion for Ron Adams, whose “Coral Charm” bloom was still holding her head up proudly for shutterbugs in the hockey arena where the show was held. For Warkworth resident Tom Harris, who grows close to 200 varieties with his partner, Dennis Gebhardt, picking multiple prize-winning posies was strictly a guessing game. 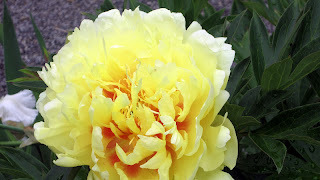 A serious case of peonies envy brought Oshawa apartment dweller Nicole Petra to the gardens almost every night for weeks. 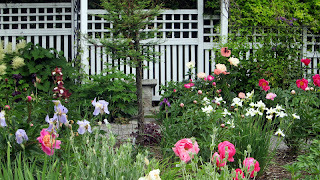 The hope, she said, is that blooms hit their moment of glory during the two-hour window when the judges come around. 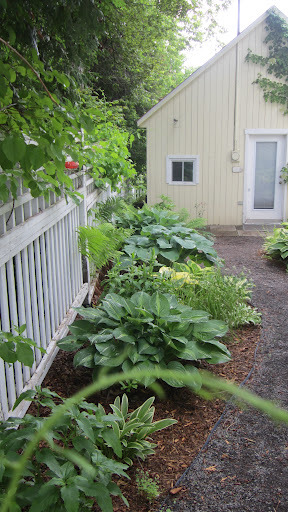 But the ordinary gardener has just as much chance as anyone else of cultivating “that one spectacular flower,” says Cook, who runs Blossom Hill Nursery with her husband, Joe. 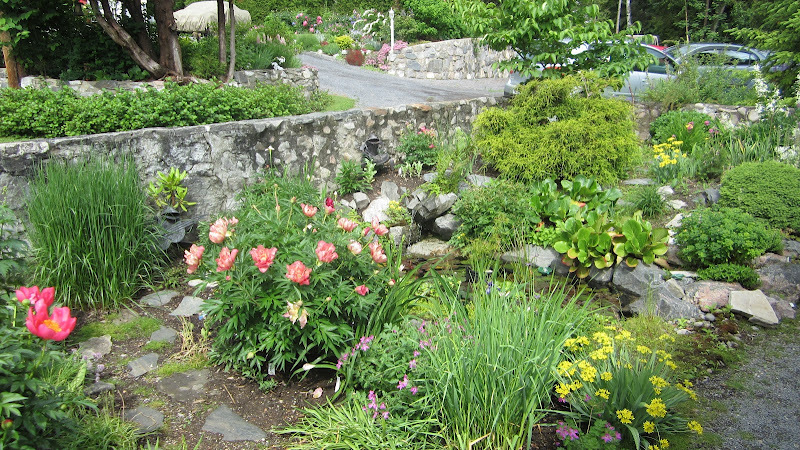 Drought-resistant, low-maintenance and bug-free, peonies are a favourite perennial for folks like Helena Ho, who’s in the midst of landscaping after moving to Newcastle from Burlington. Bowmanville resident Brian Kemp found himself at the festival with his family to celebrate Father’s Day and daughter Keira’s 16th birthday. “I’m not anything horticultural,” he said, but used the opportunity to take pictures for his flower-fancying mother-in-law’s Facebook profile. What a fantastic event. People visiting the show arrived early, before the doors opened and some tried to sneak in only to be asked to leave until we were ready. It was an incredibly beautiful day. Alas, the only thing wrong was mother nature not cooperating and many of the blooms were done in the garden. The more than 560 blooms inside however was an impressive display with many being held over for 6 weeks in hopes to show here. This made up for the lack of blooms outside. Shutterbugs were eager to take photo's. Visitors had many questions keeping our information both inside and outside hopping. The silent auction went well. 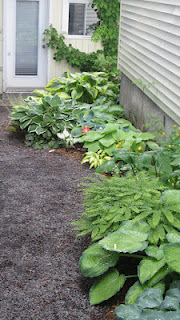 Look for more photo's of entries on our Facebook page. I am sending you a global view of the Quebec Society’s Peony Festival show which took place June 16 and 17th at the Roger Van den Hende Botanical Garden. It was the largest peony show to date in Canada with almost 1,200 cut flowers and many complimentary events. All this to say that the event was a great success. First of all, I would like to thank the QPS President, an infatigueable and determined Dutchman, who coordinated the project to its end, like Gulliver, against all odds, relying on the competence of his fellow crew. Bravo. His wife, Lise, assisted him as always. I convey other comments and thanks. 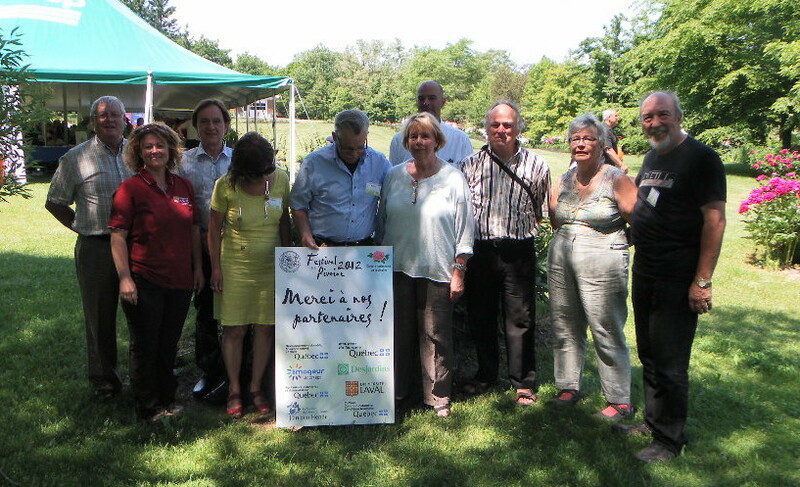 This event was the ongoing work of the entire Board – Yvon Allen, Rock Giguère, Lucie Pépin, Jacqueline Gervais, Claude Quirion, Serge Fafard et Robert Rioux who despite being sick wrote almost every day to encourage other members of the Board in their work. Maltais and Serge Fafard who showed us their formidable talents. 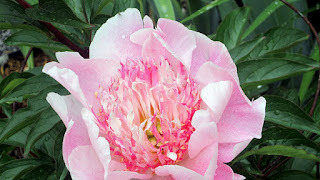 We think that this is a turning point in our shows, because it demonstrate the competence and the specialization which is beginning in Quebec and the world of peonies. A big thanks to the University of Laval authorities, especially to the Dean of the Faculty of Science for Agriculture and Food, Jean-Claude Dufour, who permitted us to use the university facilities and who gave much assistance to our Festival. 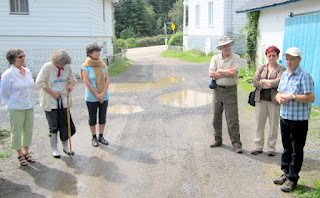 The site was perfectly suited to our Festival – the locale, parking, security, etc. 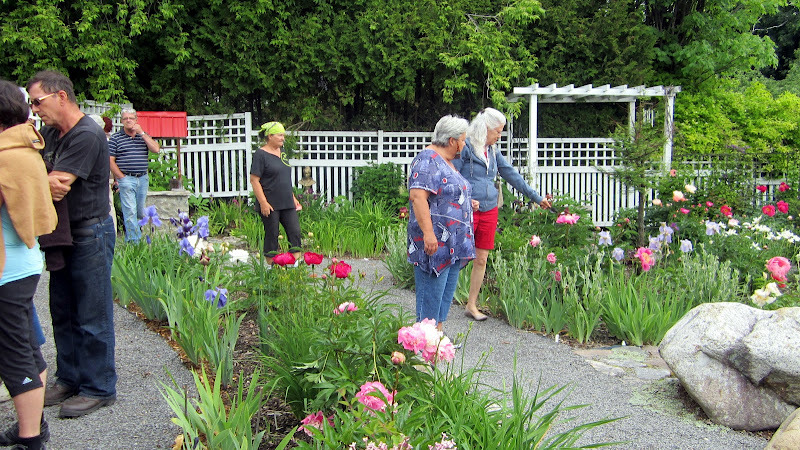 Special thanks should go to Hélène Corriveau, whose impeccable maintenance of the Botanical Garden and, most of the Peony Garden welcomed us in all of its glory. The collection benefited from the generous donation of peonies from Serge Fafard. 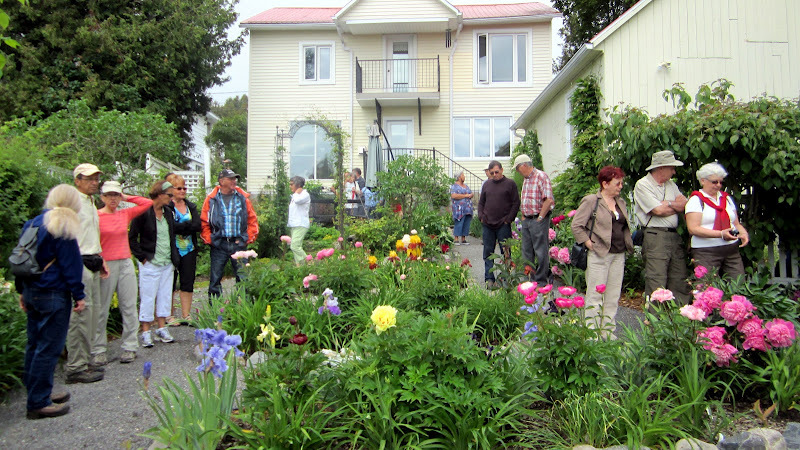 Visitors had access to the garden both before and after the Festival. To Pierre-Claude Poulin, President of the Friends of the Van den Hende Botanical Garden, our gratitude for his personal assistance and that of the volunteers from the Society – our good friends Michel Bédard, Jacques Allard and Jean-Denis Brisson. 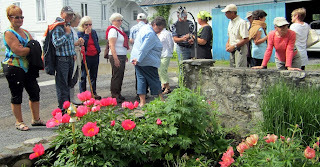 Canadian Peony Society for their visit to Quebec. It was very appreciated. The Festival was greatly assisted by our journalist friends who promoted the Festival: Larry Hodgson, Albert Mondor, Mélanie Grégroire, Claire Bélisle and Réjean Millette. 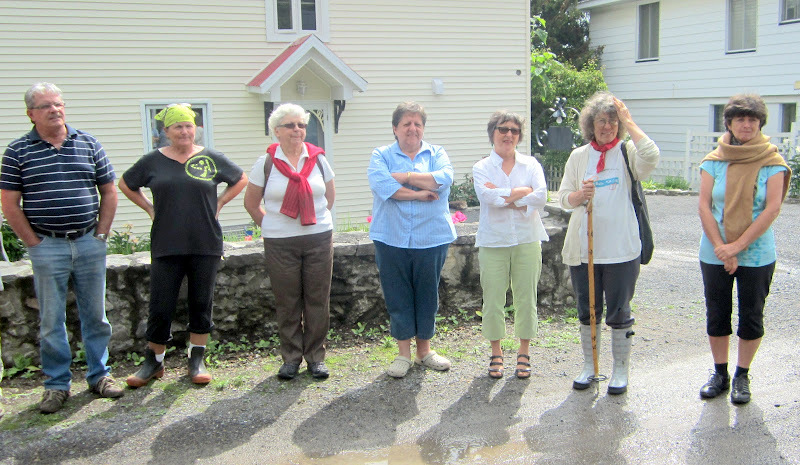 Thanks also go to TVA, which allowed Rock Giguère to make a report on the show Salut Bonjour, Week-End on the event and on peonies. 16th and to our beautiful Italian, Mano Capano, whose fields of production were open to the public for the occasion. To Wim, the brother of our President, a special thanks for agreeing to be the designated driver of the President for all of the weekend. 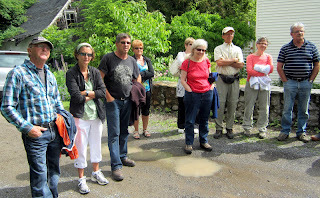 Wim also assisted us ably in several tasks. Yvon Allen, Claude Quirion, Pierre Roy and Lucie Pépin. Bravo to them for the prizes they won. Without them, the successful exposition would not have been possible. 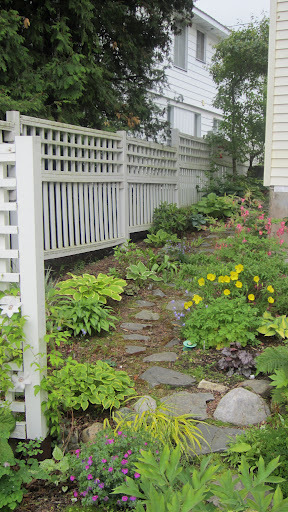 574 peonies in bloom and all seven weeks of bloom were represented. and the sale of seeds and donations for peony blooms added funds to the Canadian Peony Society. OVBG blooms were tagged and entered into the show, and Gordon Wick, our great appreciation. Lana Taylor-Mills, attended her first peony show and did a great job with selling seeds and providing visitors with information about peony roots. with ALL of the clean up, including folding all those tablecloths, and who kept us laughing. with Rose Mary through all eight Festivals and without all her help and support this show would simply not happen.